(PRLEAP.COM) Infections around dental implants are an increasingly common challenge with few good non-surgical treatment options. One solution to help manage periodontal bacteria involves prescription tray delivery of hydrogen peroxide gel. Dr. Jeffrey Goldstein offers this tray therapy and his treatment results are so good that he recently received an Orkos Award for excellence in case study of periodontal therapy. Dr. Goldstein also was honored for his efforts to help patients understand the importance of periodontal health and its relationship with diabetes and other inflammatory diseases. The patient in this case study initially presented with signs of periodontitis in 2001, including bleeding gums and deep pockets, the space between tooth and gum tissue measuring 1-3mm when healthy. He was referred to a local periodontist but refused the specialist's care. By 2004, his periodontal disease was advanced and three teeth in the upper right quadrant were no longer salvageable and extracted. Implants were placed in 2007 and the patient's periodontal status remained stable for several years. In 2014, however, he exhibited 4mm to 7mm deep periodontal pockets, bleeding on probing at 36 sites, and moderate subgingival calculus. Conditions were worst around the three implants. At this point he was desperate to save his implants and teeth, and he specifically wanted to avoid more surgery. The underlying cause of gum disease is biofilm, a community of bacteria that infect gum tissue. A salivary diagnostic test confirmed the presence of 8 bacteria associated with periodontal disease, including the high-risk T. denticola and T. forsythia. These bacterial communities (biofilms) are difficult for patients to manage. Toothbrushes, floss and interdental brushes can't reach the base of deep pockets to disrupt biofilm, and rinses don't adequately penetrate it. To help with effective bacterial management, Dr. Goldstein prescribed Perio Trays® (Perio Protect, St. Louis, MO) to place a 1.7% hydrogen peroxide gel (Perio Gel®, QNT Anderson, Bismarck, ND) deep into the pockets before and after nonsurgical periodontal debridement and laser therapy. Perio Trays are customized based on the patient's probing depths and designed to seal around the periodontal tissues. This helps drive the gel deep into the pockets and keep it in contact with exposed implant and root surfaces. Perio Tray® delivery began on August 21, 2014 and continued throughout the course of treatment, dropping from the initial four daily 15 minute increments to two daily 15-minute increments. Four rounds of periodontal debridement, laser therapy and subgingival irrigation were completed between September 9 and November 13, 2014. At a re-evaluation visit on December 19, bleeding on probing was present at 1 site and the deepest pocket measured 5 mm; the deeper pockets remained around the implants. 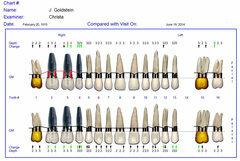 From December to February, the patient continued to use the Perio Trays regularly. At the February 20, 2015 periodontal maintenance visit, all pockets were within normal range except for four 4 mm pockets. There was no bleeding and a secondary diagnostic test confirmed a reduction in oral bacteria. Five of eight bacterial species present in the pre-treatment test were completely eliminated, including T. forsythia. Dr. Goldstein has been prescribing Perio Trays® since 2006. "I've completely changed my approach with these trays," Dr. Goldstein explains. "I can help patients treat the cause of the disease between visits instead of just treating symptoms." Research shows that adjunctive use of Perio Trays helps reduce pockets and bleeding more than debridement alone. Dr. Goldstein concurs. "In my practice, those patients who accept Perio Trays show significant improvements and are able to maintain good results. I've found that this tray delivery is the best way to manage oral biofilms between visits. In some cases, I've prescribed it to reduce bacteria and discomfort before debridement." Patients in clinical trials who were randomized for Perio Tray delivery reported whiter teeth, fresher breath, and mouths that feel good. Dr. Goldstein's patients described similar experiences. "They tell me their gums feel better, their mouths feel cleaner and probings no longer hurt. They're excited to know we can reduce the bacteria, and their spouses get excited about the resulting fresh breath. While my top priority is patient health and educating patients on the importance of good oral health for general wellness, these desirable side effects help with patient satisfaction, compliance and overall health maintenance." 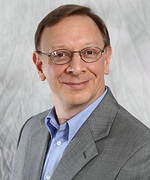 Dr. Jeffrey Goldstein practices in Penndel, PA and highlights on his practice are available at www.thetopdocdmd.com. 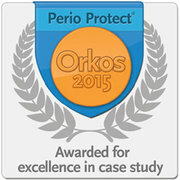 For details on the Orkos Award or to view other case study winners, visit www.TheOrkosAward.com. Additional information on prescription tray delivery is available at www.PerioProtect.com.